Immigration and Customs Enforcement, ICE, seized a rare painting that was stolen by the Nazis during World War II. 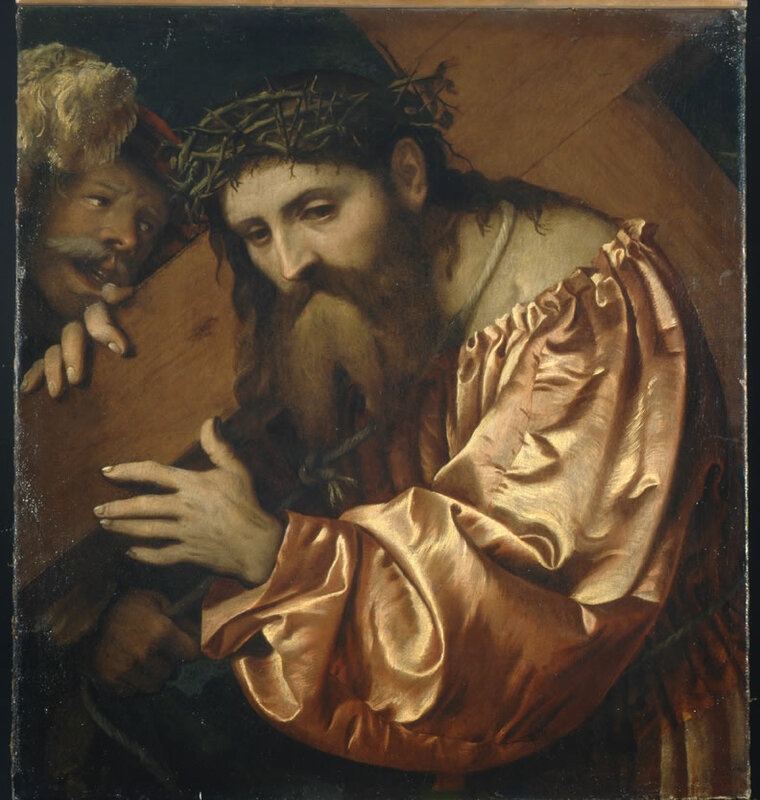 Officials say the masterpiece work of art – "Christ Carrying the Cross" – was stolen as part of the widespread Nazi plunder of World War II. But it was seized Friday by ICE's Homeland Security Investigations – HSI. The painting was seized through formal legal proceedings in order to protect the art until its real ownership is finally confirmed. The U.S. Attorney's Office and ICE HSI filed a seizure action Friday against the painting "Christ Carrying the Cross Dragged by a Rascal," by Girolamo de' Romani, known as "Romanino." The painting, which dates to circa 1538, depicts Christ, crowned with thorns and wearing a striking copper-colored silk robe, carrying the cross on his right shoulder while being dragged with a rope by a soldier. It has been on display at the Mary Brogan Museum of Art and Science since March 18, 2011, and was part of an exhibition of 50 Baroque paintings on loan from the Pinacoteca di Brera in Milan, Italy. The seizure complaint and supporting affidavit allege that the painting is among many works of art and other valuable items taken in a forced sale from the estate of Federico Gentili di Giuseppe. Gentili died in 1940 in Paris of natural causes, just months before the Nazi army invaded France in 1941. After receiving advanced warning of the impending Nazi invasion, Federico Gentili's children and grandchildren fled from France, escaping to Canada and the United States. Other family members, who were unable to flee, died in concentration camps. Gentili's grandchildren have taken legal steps internationally to find and reclaim works illegally taken from their family during the Nazi occupation. In a landmark 1999 decision relating to World War II plunder, a French Court of Appeals forced the Musee de Louvre in Paris to return five paintings to the Gentili family, and ruled that the auction of the Gentili estate in Nazi-occupied France was an illegal forced sale and a "nullity." U.S. Attorney Pamela C. Marsh, Northern District of Florida, said that under U.S. law, the painting cannot be returned to Italy until the ownership disputes are resolved. "Our interest is strictly to follow the law and safeguard this work until the courts determine rightful ownership. Through this process, all rightful claimants may be heard, and we can rest assured that justice will be done for all parties involved in the dispute," she said. Earliest records about the painting indicate that it dates back to around 1538. It then appears in the collection of Antonio and Cesare Averoldi, and then in the Crespi Galerie. On June 4, 1914, the Crespi Galerie put this painting and others up for auction in Paris, where it was subsequently purchased by Federico Gentili. After Gentili died, his estate was auctioned by French Vichy authorities in 1941, acting in concert with the Nazi occupiers, and the Gentili heirs were prohibited by law from returning to claim the painting. Several extraordinary anti-Semitic laws had been imposed, depriving French nationals who had left France of their nationality and arranging for confiscation of their property. Another German Order dated Sept. 27, 1940, established that, "Jews who had fled from the occupied zone were banned from returning there." As a result, the painting was sold in the illegal, forced sale of 1941. The painting was then acquired by the Pinacoteca di Brera in 1998. U.S. Attorney Marsh and Assistant U.S. Attorney Bobby Stinson are prosecuting the federal case for the United States. ICE HSI plays a leading role in criminal investigations that involve the illicit importation and distribution of cultural property, as well as the illegal trafficking of artwork. The agency specializes in recovering works that have been reported lost or stolen. The ICE HSI Office of International Affairs, through its 70 attaché offices in 47 countries, works closely with foreign governments to conduct joint investigations, when possible. ICE HSI specially trained investigators, assigned to both domestic and international offices, partner with governments, agencies and experts to protect cultural antiquities. They also train investigators from other nations and agencies on investigating crimes involving stolen property and art, and how to best enforce the law to recover these items when they emerge in the marketplace. Since 2007, ICE HSI has repatriated more than 2,500 items to more than 22 countries including paintings from France, Germany and Austria; an 18th century manuscript from Italy; and a bookmark belonging to Hitler, as well as cultural artifacts from Iraq including Babylonian, Sumerian and neo-Assyrian items.